A 2013 Human Rights Watch report says that child sexual abuse is disturbingly common in India, but that most cases go unreported due to fear of social stigma and lack of an adequate mechanism to help children. But initiatives like CHILDLINE's offer hope that help is at hand. CHILDLINE also boosted its child sexual abuse awareness campaign in schools in Mumbai, and has been invited by the municipal corporation to conduct workshops in all of its 1,400 schools. 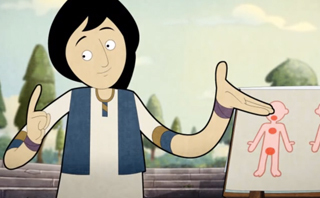 The organization made Komal, an animation film about safe/unsafe touch and personal safety, which is available in 12 languages and accessible versions for the disabled. As part of its police sensitization programme, CHILDLINE commissioned posters and a booklet on the long-pending Protection of Children against Sexual Offences Act, which was passed by both houses of Parliament on May 22, 2012. These posters and booklets are available in over a dozen languages. With increased awareness among children and adults, let's hope that we as a society will be able to break the silence around child sexual abuse. 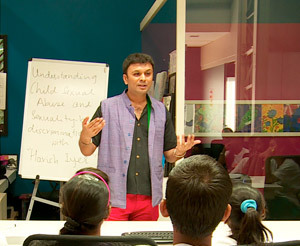 Childline India Foundation runs CHILDLINE 1098, India's 24-hour emergency helpline for children in distress. Launched in 1996, CHILDLINE is available in 291 cities and districts in India. By 2017, the organization plans to make the helpline service available in all of India's 630+ districts. CHILDLINE works for the protection of the rights of vulnerable children, including victims of sexual abuse, forced labour and trafficking, as well as street children and missing children, among others. Children who need direct intervention are reached within an hour of calling 1098. CHILDLINE rescues children from abusive situations; provides immediate medical help, shelter and counselling; and links children to organizations that provide long-term care and rehabilitation. The helpline also answers calls by adults looking for help for children. CHILDLINE India Foundation is directly supported by the Ministry of Women and Child Development under the Integrated Child Protection Scheme, and is the parent organization for CHILDLINE centres across the country.